Having a pretty website is the bee’s knees. It feels fantastic. But 3, 6, 9 months down the road, will it feel as good? A lot of times when I’m talking with business owners, they tell me that the first month after a web design is great, but the see disappointment down the road because they don’t see new business as a result of the thousands spent on a website redesign. The objective is to achieve a data-proven ROI. Buyer personas were the focus of day two’s discussion, stressing the importance of catering to specific types of customers with website and blog content. To best illustrate this, we studied current and famous videos to see how big companies target highly-specific people. Volvo does an awesome job of pitting the quality of their high-end SUV against a competitor’s equivalent vehicle. The persona is what makes all the difference. The mom depicted in the Volvo is fun and engaging, while the woman in the other car is uptight. Their target persona relates with the woman and her family in the Volvo. In stark contrast to the Volvo example, the Dollar Shave Club spot targets men — and they do it so well. Comprised of pithy jokes and a disconnected narrative, the viral YouTube video has over 10,000,000 views and is largely responsible for Dollar Shave Club’s rise to fame. The persona identified is a young, perhaps college-aged male, who is tired of the hassle and cost surrounding new razors. This is somebody with whom convenience, cost, and cool factor would most resinate. The next step for the class was to identify their own unique personas using the Business Owner’s Guide to Aligning Sales & Marketing with Buyer Personas eBook, which is a step-by-step guide and template for persona development. Persona development is important, because if you aren’t talking to the right people, how in the world will you drive qualified leads? 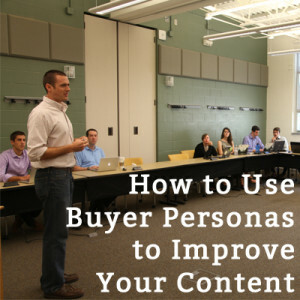 Use buyer personas to better understand your customers. Implementing them across departments will help everyone put the customer first and improve the overall level of customer care. To learn how to create buyer persona profiles that apply to your business, download our free PowerPoint eBook bellow. Inside you’ll learn how personas can align departments and lock in focus on the customer. There is also an easy to customize template included in the download. Enjoy!